This artist's concept illustrates the two Saturn-sized planets discovered by NASA's Kepler mission around a star called Kepler-9. A 3rd planet, just 1.5 times the size of Earth, may also be orbiting the star. This is the first star system found to have multiple transiting planets. Thisstory was updated at 2:52 p.m. ET. Atantalizing group of alien planets that may include the smallest, most Earth-sizedworld yet seen has been discovered around a star like our sun, NASA announcedThursday. Observationsfrom the Kepler space observatory confirmed two Saturn-sized planets that orbit a starabout 2,300 light-years from Earth. They also revealed a candidate for apossible planet roughly the size of Earth within the same system.? Astronomershave not yet confirmed the potential Earth-like planet, but early analysissuggests it has a radius just 1.5 times that of Earth. The Earth's radius isabout 3,962 miles (6,378 km). Additional observations of the planetary systemwill help confirm the planet's existence, researchers said. "Our hope is that in the coming daysor weeks, we'll be able to be more definitive," said William Borucki, Kepler'smission science principal investigator at NASA's Ames Research Center inMoffett Field, Calif.
Forthe first time, analysis of Kepler observations was also combined with transittiming and radial velocity observations to estimate the masses of the alienplanets. However,the planets are so close to their parent star that their orbits would fitinside the orbit of Mercury in our own solar system, astronomers said. TheEarth-sized world, if confirmed, would be so close to its star that it wouldlook nothing like Earth. It would be hot and likely not habitable. Astudy led by Matthew Holman, associate director of the Theoretical AstrophysicsDivision at the Harvard-Smithsonian Center for Astrophysics in Cambridge,Mass., examined the newly confirmed planetary system. The results are detailed inthe Aug. 26 online edition of the journal Science. TheKepler planets are the second group of alien worlds to be announced this week. OnTuesday, astronomers with the European Southern Observatory announced the discoveryof up to seven planets (though two remain to be confirmed) circling a star127 light-years from Earth. That find also included a potential Earth-likeplanet, one that is 1.4 times the mass of Earth. Astronomersdo not yet have a mass estimate for the possible Earth-like world seen by theKepler observatory, Holman said. Forthe time being, the potential third planet about Earth's size remains only acandidate, but if confirmed, it would be the "smallest known planet to date," he added. "We can say, in terms of its physicalsize, it would be the smallest, but we don't know its mass yet," Holmantold SPACE.com. Kepler'sobservations suggest the planet has a radius that is about 1.5 times the radiusof Earth, and an orbital period of about 1.6 Earth days, which is much shorterthan Kepler-9b and 9c. Ittakes the larger planet Kepler 9b about 19.2 days to complete one orbit. Theother Saturn-sized world makes one orbit every 38.9 days. Researcherswill need to confirm that the candidate body is orbiting the same star, and isnot the result of a so-called astrophysical false positive. Still,the ability to detect such a small candidate demonstrates the sensitivity ofKepler's instruments, and shows that the mission is on track, he said. "Thisshows that we're able to find not only long-period systems, but small planetsas well," Holman said. "One of the messages of this work is thatKepler is making progress toward its goal of finding systems of planets thatare similar to our own solar system. But,in terms of habitability, the Kepler-9 system may not be the best place tosearch for life forms of any kind. "It'svery unlikely that these planets are habitable," Holman said. Holmanestimated the temperatures of the two large planets by measuring the amount oflight they reflect, which gives a rough idea of how much the planets absorb theparent star's light. Given these assumptions, the Saturn-sized planets areprobably 740 degrees Kelvin (872 degrees Fahrenheit) and 540 degrees Kelvin(512 degrees Fahrenheit), he said. "Thosetemperatures are far beyond the boiling point of water, so these are nothabitable planets," Holman said. "This would not be the first placeto look for habitability." Holmanand his colleagues analyzed seven months of Kepler data, and were able todetermine the size of the planets by measuring the amount of light they blockwhen passing in front of the parent star. To estimate their masses, however,the researchers had to observe the gravitational interaction between the twoexoplanets. "Whatyou get from Kepler is just the size ? you don't get the mass," Holman said.But in the case of the Kepler-9 system, there is more than one planettransiting the star. We can see the deviation from the times at which theplanets transit and measure how much the planets are gravitationallyinteracting, which is due to their mass." TheKepler space observatory stares at a patch of the Milky Way that contains morethan 156,000 stars, in the constellations Cygnus and Lyra. The spacecraftmonitors the stars for subtle changes in their brightness, which could indicatethe presence of alien planets passing in front of them as seen from Earth. Bymeasuring the tiny decreases in the brightness of stars when planets cross ? ortransit ? in front of them, astronomers can determine the size of the planet. InJune, Kepler mission scientists announced that more than 700 candidateexoplanets had been found, including five systems that appear to have more thanone transiting planet. Researchersrun these candidates through a set of procedures to verify that the signals areindeed from planets, and are not false positives created by binary stars. "Whatis really important here is timing signatures," Holman said. "Theyare characteristic of the mass of the planets, so we can say with confidencethat these are planets and not stars." Thetwo Saturn-sized planets in the Kepler-9 system do not have precisely circularorbits, said Holman, but they are not highly elliptical, either. From detailedmodeling and by analyzing the timing variations, the researchers were also ableto discern the planets' orbital plane. "Wecan verify by the timing variations that the planets occupy a very similarorbital plane," Holman said. "We expect that they have similarco-planarity to our solar system ? probably co-planar to 10 degrees or so. But,their orbits are pretty different." The orbitsof the exoplanets can also shine a light onto the formation history of theplanetary system, said Alycia Weinberger, an astronomer in the Department of Terrestrial Magnetismat the Carnegie Institution of Washington in Washington, D.C. Given theplanets' timing variations and orbital resonance, they "had to changetheir relative positions with respect to each other and respect to the starover time," Weinberger said in a media teleconference about the discovery. 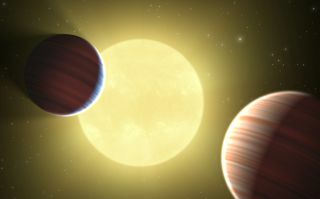 Understandingsuch planetary migration will help astronomers understand the initialconditions that led to the final configuration of the Kepler-9 system, andother planetary systems discovered in the future. Furthermore,it is possible that there are other planets that transit the same parent starin the Kepler-9 system that have yet to be found. "It'spossible that there are other planets there that don't actually transit thestar," Holman said. "If a planet has a more inclined orbit, anddoesn't cross the face of the star from our line of sight, we would only detectit from the timing variations." Holmanand his colleagues are hoping to expand upon their study by using Kepler andother data to develop a census of the planets in the system.